Maybe you commute. Maybe you travel. Maybe you just like to drive. In any case, smartphone apps are key—and not just for navigation. • Trapster: A speed trap finder with mixed reviews, mainly for poor design and unreliable data. 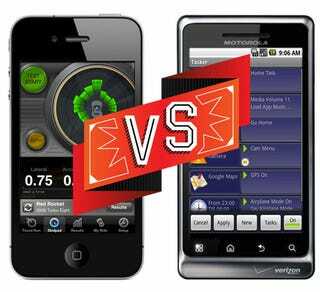 • Car Finder: Do people actually use these GPS car finding apps? If so, this is a solid choice. • iWrecked: So you've crashed your car into a tree. What do you do next? Pick up your phone and... open an app, of course! Installing iWrecked is just about the most portentous act you can engage in with your iPhone. Seriously though, this has good info for after you've called the cops. • RepairPal: Kayak-like price comparison for local repair shops. Best corroborated with additional research, but it's a good start. Okay, Tasker is more than just for use in the car, but it can make doing things so, so easy when you're in the car. Here's what Tasker does: it performs a set of actions given certain rules and context, a if X happens, then Y will follow kind of deal. So if you're in your car and turn on Car Home on your Android phone, Tasker will know to also shut off Wi-Fi, turn on GPS, flip on Pandora, and crank the volume. Or it could open NPR just as you hit traffic (or a certain GPS point). As an added bonus you can program it to read text messages out loud. It's an "advanced" sorta app but once you figure out how to program it to your liking, you won't be able to live without it. Turns your smartphone into a smarterphone, if you will. $6.37, Android. Come on, we've all wondered where the hell we parked our cars before. With ParkDroid, you can tag your parking spot so you'll never have to comb through every street to find your car again. It'll be right where you tagged it! ParkDroid also sifts through free parking and toll parking, and can remind you when the meter's up. A great app for the car, when you're out of the car. Free, Android. GasBuddy maps out nearby gas stations or gas stations near a certain point so you'll always know where the best place to fill up is. Free, Android. • Car Home/Google Maps Navigation: These apps are no-brainers for any Android commuter, they're only this low because of their obviousness. • aCar: An app that can track maintenance, fuel mileage and other mechanical type things.